Here’s the answer — in case anyone asks you. 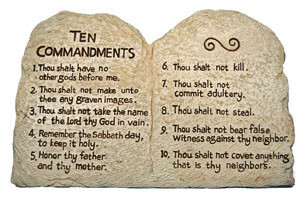 Thomas Aquinas articulated that “Natural Law” is stated by Divine Law, in The Declogue of The Ten Commandments. John Locke believed that the only reason for the existence of government was to preserve natural rights and, by extension, man’s happiness and security. James Madison, Jr. American statesman political theorist, and 4th U.S. President, said ”We have staked the whole future of American civilization, not upon the power of the government, far from it. We have staked the future of all of our political institutions upon the capacity … of each and all of us to govern ourselves, to control ourselves, to sustain ourselves according to the Ten commandments of God.” — James Madison, 1778, before the Virginia State Legislature.